Ratz,heh yeah ! runnin from platform to pillar to post ! where is the next comic? Its been ages! What happened? No comics posted for quite a while. Hope we are back to a smile/laugh at ourselves at each day's start at the earliest. Thanks Arun for the update. Looking forward to U-turn updates to laugh at ourselves. Noticed that goergo.in was stale with no updates beyond Aug 31, 2009. Aravind, have replied to your email. So true... 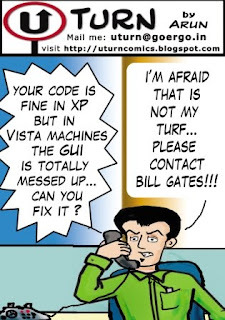 If you want your program look fine both under XP and Vista, you either have to keep it minimal or produce lots of compatibility code, which just delays program's reactions. Yeah.